Just recently, I guided a returning client (Andrew) for 8 hours, encompassing 4 hours in daylight and 4 hours in darkness – the later of which I had to talk him into! A really nice bloke, just over a year ago, Andrew was one of my first ever clients. I can vividly remember his rod arching over very close to his stance high up on a rock mark, followed by it ‘twanging’ straight again when the hook pulled out of a bass’s mouth – the fish seemingly using the backwash of a retreating wave to make good its escape. The conditions on that day were superb and I was anticipating a bass at almost any moment. And when his rod slammed over in 6″ of water, about 2m from his rod tip, whilst fishing from a shingle beach we both thought bass! Luck clearly wasn’t on our side that day, confirmed when a very plump wrasse appeared from the white water! Everything felt right during Andrew’s first session with me last year – but sometimes you still need a little bit of luck on your side to actually land one! I can be very persuasive! So onto Andrew’s most recent session that occurred on the 9th October. We’d met inadvertently 2 weeks prior (when I was out guiding another client) and I was really taken aback at how much he was looking forward to ‘our session’. Obviously I want all my clients to catch, but he really did give me some excellent business related advice a year or so ago therefore, I was even more determined for his session to be a memorable one. I haven’t caught a bass since mid-August Marc, no pressure then!” was the text I received the evening before the session – cheers Andrew! Upon meeting up, I explained the plan for the next 4 hours was to fish the ebbing tide over primarily very rocky, weedy, snag ridden ground. I’d lost a very nice bass in daylight from this area on an OSP DoLive Stick (in the Soft Shell Smoke colour) a couple of days before therefore, I felt confident that by fishing the very shallowest of water with weedless soft plastics and the deeper sections with either diving minnows or small surface lures that we would see some action. Andrew firing out a weedless soft plastic (a lure type that he hadn’t really utilised before) as the tide ebbs off of a shallow reef system. Relatively inexperienced with soft weedless plastics, Andrew was eager to learn how and when to fish them. And with clear water, a dull sky and bit of ‘chop’ on the surface, the ingredients for a bass attack were all in place. Indeed, as we stepped out across the reef I could see gobies and immature mullet(?) prevalent along these reefy intertidal zones desperately seeking shelter (under rocks or in deeper pools) as the tide retreated at a rate of knots off of the reef. Being the apex predator and opportunistic hunter that they are, I’m positive that bass know all too well that these small prey items are almost in a state of panic! This is the type of ground that has been so productive at night. Note the shingle (which would be your stance over high water) and the deeper depressions and pools searched out by bass amongst the reef. More often than not, when you receive a bite/hit it will be in the vicinity of these very specific areas. It remained awfully quiet. No boils on the surface, no ‘follows’, no ‘taps’ on the rod tip by wrasse and certainly no full-blooded hits from a bass. We continually moved with the tide, changing lures occasionally and keeping low – as stealth tactics often prevail when the water is so clear. What was very useful though, was that I had earmarked one particular stretch of reef as Andrew’s night fishing venue. 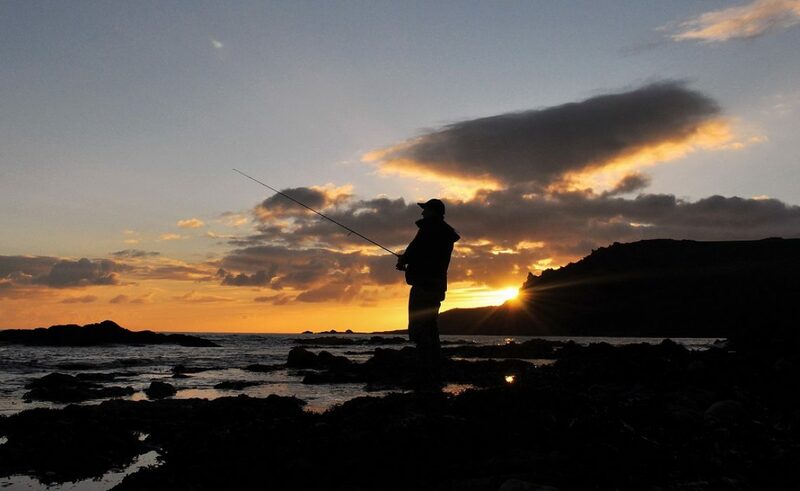 At around 40m wide, the area is a beautiful, secluded naturally crafted shingle backed cove whereby a short (5 – 20m) cast allows you to work a lure over some the tastiest looking reef I have ever seen! I explained to Andrew how bass will use the deeper channels to navigate around the reef, before waiting in the depression and pools for unsuspecting prey items (or his lure) to effectively swim over their heads. Moreover, what is hugely apparent about these types of marks is the sheer amount of ‘life’ to be found in amongst and under the rocks – again, I am positive that this is what attracts bass so close to the shoreline. Andrew found all of the above fascinating and by now, couldn’t wait to hit the beach in darkness. With a 5.1m (Salcombe scale) high tide at 2119, the plan was to fish the 2 hours before and after high water. Furthermore, the weather forecast for the evening was very light winds, mist and broken cloud – ideal considering the Moon was due to rise at around 2115 – 2130 which was just as the tide would also begin to ebb. Navigating through the dark Devon lanes, even though this is something I have become extremely accustomed to – it still felt like we were a couple of night owls in search of our prey. Following a short walk, we arrived at the perfect time for the water to be a couple of metres up the shingle meaning there would be around 18″- 2ft of water over the reef proper (obviosuly more over the depressions). If you’ve never caught a bass at night by design, as indeed I hadn’t until April this year, then your mind will continually tell you a number of things: that bass can’t see a lure at night, why would they be attracted to a 6″ piece of rubber that is doing nothing in the water, that bass won’t be caught so close to the shore etc. This is ‘leap of faith’ fishing in that you need to experience it ‘first hand’ to believe it works – from there you won’t look back. With retrieve rates explained, I attached a white 6″ senko to Andrews lure clip. He was using the same rod that I routinely use – a Major Craft Skyroad 862ML 10-30g that he couples with a Shimano Stradic CI4 3000 reel. Within the first 10 casts Andrew had received a good ‘tap’ on the rod tip – something that is always encouraging, but possibly signals small bass or even Pollack are in the area. Either way, its always good to receive your first ‘bite’ when trying something new and possibly outside your comfort zone. What is so wonderful about lure fishing in darkness is the anticipation levels are markedly increased, and at times, as the guide I am almost expecting a fish to hit the lure at any moment and with practically every turn of the reel handle. The bass sometimes just ‘appear’ out of nowhere and you can be casting into the same spot for hours when suddenly you feel that rod wrenching pull down! Sure enough, with precisely 1½ hours until high water Andrew had a sharp YANK on the rod and he was in! The bass had nailed the senko over one of the deeper pools at a range of 12m from the beach. At 42cm, it gave a very good account of itself for its size which had me thinking it was a lot bigger until I saw it. But, to Andrew this was magical – he had never caught a bass in darkness in this manner and he was extremely happy as you can see in the photograph below. 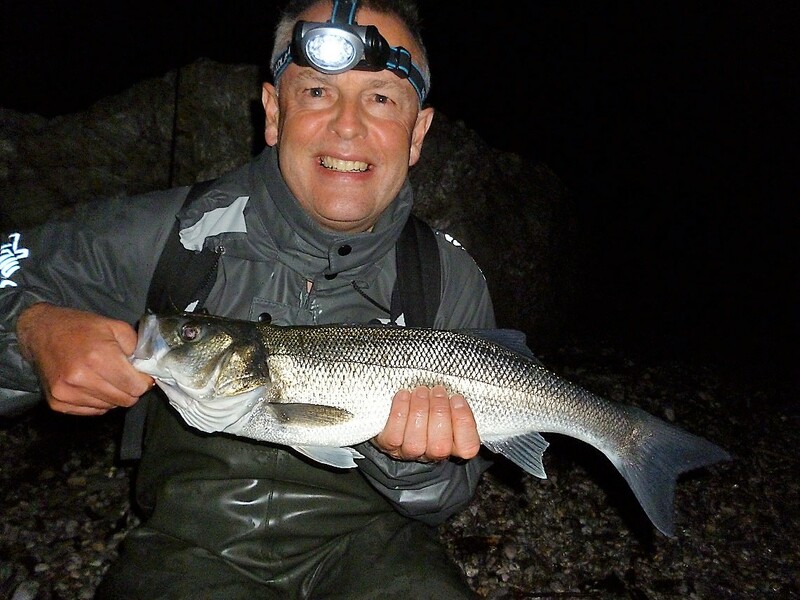 Quite often, when you catch one bass from a reef at night you do have an excellent change of catching another one – something I relayed to Andrew just as the tide reached its peak and began to ebb. Up until this point, it had been totally pitch black, with no ambient light at all due to the cloud and mist. But as often happens, with the ebb the cloud began to break and the mist began to lift. With 30 minutes or so of the session remaining, high above the cliffs to our left a half Moon appeared. As per the previous occasions when this has occurred, it was like turning on the floodlights to a stadium! Coupled with the ebbing tide beginning to really ‘pull’ (a period that has admittedly seen some superb catches) would it transform our fortunes on this occasion? One word – Yes! Following the commotion of a hooked and lost fish, I encouraged Andrew to cast into an area on the left hand side of the cove whereby he would be targeting a submerged pool that until now, we’d left well alone. First cast WALLOP! and this time it felt larger according to Andrew – and even though it didn’t fight as hard as the first fish, it certainly put a bend in the rod! Upon the bass hitting the shingle I am happy to admit that a few ‘Man hugs’ ensued! Andrew was made up, and to think that 5 – 6 hours earlier, he had been stood (as I turned over the rocks to highlight the amount of life present) exactly where he had now hooked and landed a very respectable bass. In the course of my guided night fishing sessions, and indeed my own catches this season, the 1½ hour period following high water and into the ebb has seen some very consistent results. I believe the increased ‘movement’ of small fish, shrimps and crustaceans when they sense the water depth is beginning to decrease signals ‘dinner time’ to a marauding bass. I would love to hear the opinion of my readers therefore, please do comment if you have experienced similar occurences or observed patterns contradicting my own results, Indeed, I believe the Moon setting or disappearing behind the clouds can have the same affect on a reef, in that the prey items may suddenly feel safe – this was certainly the case when another client recently caught a 70cm (8lb+) bass (report to follow in the coming week or so). For me though, sudden or relativey sudden (over a few minutes) changes in light levels, both in daylight and especially in darkness do appear to increase bass activity. In the video below you can clearly see the Moon over Andrew’s left shoulder as he safely returns the bass. One final observation. It was quite chilly whilst we out that evening with the air temperature at around 7°C. When we held the bass its body actually felt very warm. Further, when we waded into the water to return it the sea felt like a bath in comparison with the air. Considering the sea temperture was around 15.5°C in early October this isn’t surprising but the contrast was so significant it warranted a mention. Above all else, I was very happy to assist Andrew in ending his barren bass run!